I’m hoping I get my Run Weightless Singlet I ordered this morning sometime tomorrow so that I can take it out for a run and get you a report on how it feels while sweating. My initial feeling of the fabric in store was that it felt a bit like a cross between latex and tencil and felt odd but it did feel really light weight so I’m intrigued enough to bite the bullet and give it a try. Breathable and lightweight are two different things and I suspect this doesn’t have a ton of breathability based on how much sweat it can absorb. 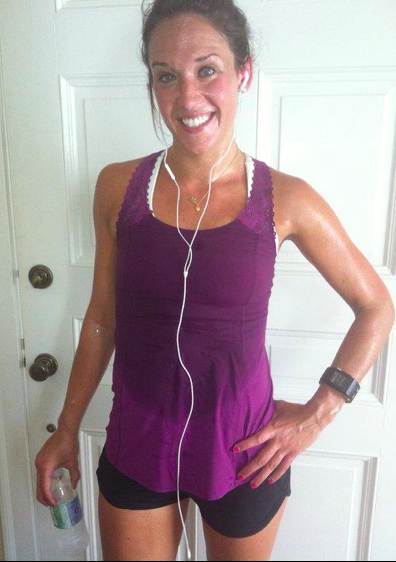 Here you see an image of just how much sweat accumulates in the fabric. I’m not really bothered by how much sweat shows because…well I plan on sweating buckets anyways. The only time I really worry about sweat showing is if I’m in a class and it’s sweat marks in areas down yonder. "More Run For Your Life Pullover Pictures (from Australia)"